Image above: A portion of the Cordillera Vilcanota, including Nevado Ausangate (upper left), Sibinacocha (the big lake), and Quelccaya Ice Cap on 31 March 2018 (Sentinel-2 image). Our understanding of Quelccaya's response to ENSO will be further refined when we are able to examine accumulation resulting from the ongoing La Niña event (2017-18). Since last September, negative sea surface temperature anomalies have persisted in the east-central equatorial Pacific. These SST anomalies have been slightly more negative than last year, which followed very warm anomalies associated with the 2015-16 El Niño. Quantifying the timing and properties of this newest accumulation cannot occur until we visit the weather station, since our data telemetry system failed in 2017. 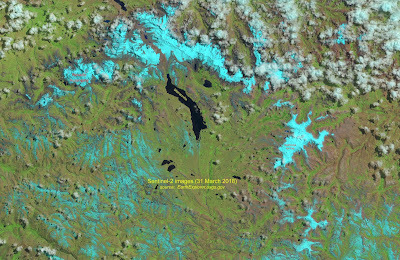 However, satellite imagery suggests that snowfall has been considerable this year. The image above provides the first relatively-clear view of the glacier and surrounding terrain in several months. In this ESA Sentinel-2 "natural-color" image (bands 4, 3, and 2), glaciers and higher peaks are entirely snow covered, and a dusting of snow is visible on terrain west and south of Quelccaya. Greater detail can be seen in the cropped image below, showing only Quelccaya - and revealing that glacier ice is not exposed even at the lowest elevations (~5,200 m). 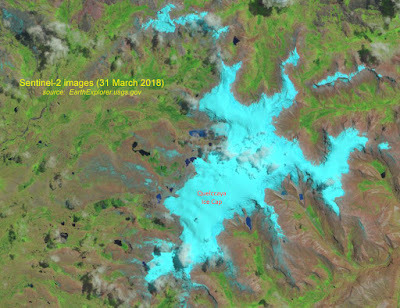 Finally, the GIF image at the bottom shows the Sentinel-2 EO Agriculture composite product, on approximately 1 April of the past 3 years. Note in particular the vegetation color difference between the El Niño year 2016, and the next two wet seasons during cold phase ENSO events. Also, there appears to be more snow around the glacier margin this year than in April of 2017. Our ENSO paper will document such ENSO variabilty at the summit of Quelccaya, in terms of snowfall seasonality, the vapor initial d18O values, and air temperature.